FIFA 14's UK launch is to star Gareth Bale, triple footballer of the year as the cover star. The Spurs attacker was motion captured into the game on UK soil - itself a major departure for EA - just weeks ago. EA Canada's Capture Lab flew in to London especially last month to film the Tottenham forward's trademark free-kicks, dribbles and celebrations for the football franchise's first foray on to the next-generation consoles, PS4 and Xbox One. T3 was there - read our FIFA 14 video and image exclusive behind-the-scenes report on the tricks and the tech of Bale's FIFA 14 mo-cap adventure. Bale's skills were captured with 58 Vicon cameras, each costing a cool £30,000, at the tech-laden Oxford studio of Audiomotion, the mo-cap firm that worked on World War Z. It marks the first time FIFA's motion capturing has been done "properly" in the UK, the series' animation director Gareth Eaves told T3, and is a rare excursion overseas for Capture Lab. The process is usually carried out alongside the UFC, Fight Night and NBA series at EA Sports' 118-camera, fully turfed, industry-leading HQ in Vancouver. "Bale's tricks are actually already in the game," Eaves said of how the session was unusually late in the development process. "We had a go at replicating his moves before we knew we were going to get this. I think Bale can probably do a better impression of himself, though." EA Sports' most famous previous decamping was when Audiomotion packed up its motion-capture kit and took it on tour to Barcelona's Nou Camp, to film Lionel Messi and co. 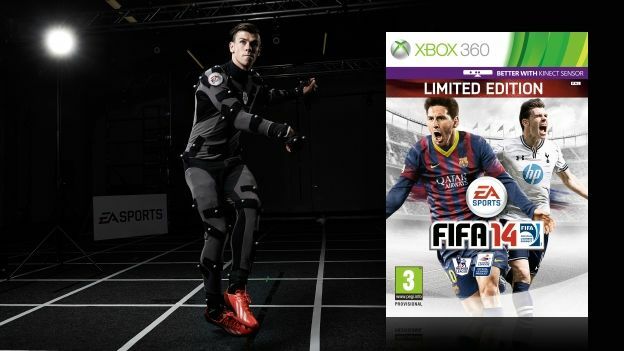 The September-released FIFA 14, the first in the series to use EA Sports' new Ignite engine, is set to be fronted by Messi on the international cover, but the Barcelona striker will be joined by Bale on the UK, Ireland and Middle East editions. "The players that have been on the cover since I was a kid have been legends of the game, it's a great honour," said the Welshman. EA Sports' FIFA 14 is out on PS3 and X360 on September 27, PS4 and Xbox One later this year. FIFA 14 Limited Edition is available to pre-order at GAME.co.uk. Order before August 1st and get 24 FIFA 14 Ultimate Team Premium Gold Packs. Watch our exclusive video of Gareth Bale and T3 getting our mo-cap on below.